Let's nip your enthusiasm right in the bud: No, these motorized skates you see above aren't actually powered by rockets. Now hold on, don't close the browser tab just yet. 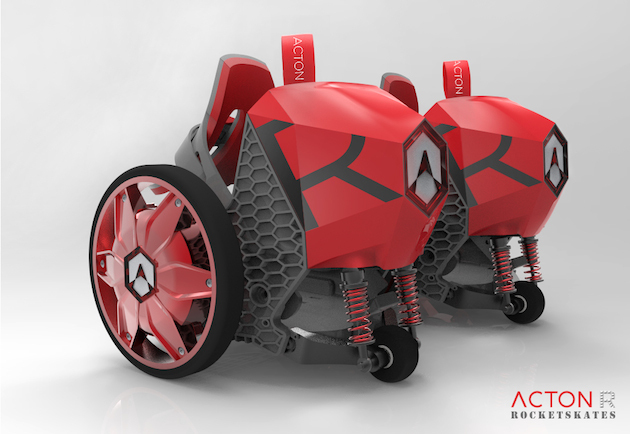 Just launched on Kickstarter, Acton's RocketSkates do have a rather misleading name. But they're actually quite the improvement over the Spnkix, the company's previous effort at a pair of motorized skates (which, incidentally, unceremoniously crashed our podcast stage during CES 2013). Unlike the Spnkix, the RocketSkates are about six pounds lighter, have four hub motors instead of two, are 15 percent smaller and can zoom up to 12 miles per hour. Oh, and most notably, the RocketSkates don't require a remote to operate. That's right; just like regular skates, these motorized puppies can let you zip around the sidewalk completely hands-free. Like its predecessor, you can wear most any regular shoe with the RocketSkates -- simply strap it on and you'll be ready to get started. It comes with either a large or small foot plate depending on the size of your feet. You'll also have to decide which foot you want to be your lead skate; the lead tells the other skate what to do. To accelerate, simply tilt forward, and to slow down, just tilt back on your heels. Think of them as mini Segways for your feet. Peter Treadway, Acton's co-founder and CTO, says they take a little while to get used to, though he says those new to skating could find it pretty easy to learn. There's an onboard microprocessor in each one and both are powered by a lithium-ion battery pack. Turning the skates on is as easy as pressing the power button on the back, and you can simply start rolling for the motors to kick in. Treadway demonstrated it at the Wearable Technologies Conference in San Francisco with a prototype model, and he did seem to glide smoothly around without much effort. He tells us you can walk in these RocketSkates as well, which is good if you need to go up a flight of stairs in between skate sessions. Another feature that sets these RocketSkates apart is that it connects with a companion app, available on both iOS and Android, via Bluetooth. The app gives you a variety of information like how far you've traveled, mileage and your skates' battery life. It can even track your route for you and let you compare it with others. There's also a potential for "interactive gaming," though Treadway tells us this might come later depending on what developers do with its SDK. Last but not least, you can use the app to wirelessly control the lead skate as if it were an RC car for a bit of fun. The RocketSkates comes in three models -- the R-6 lasts for 45 minutes or 6 miles and comes in "Rocket Red"; the R-8 lasts for 70 minutes or 8 miles and has a "Titanium Chrome" color; while the R-10 lasts for 90 minutes or 10 miles and is available in "Deep Space Black." A pair of skates takes about 90 or so minutes to charge. Acton's transportation designer, Jennifer Choy, gave us a bit of insight behind the RocketSkates unusual design. "The hexagon is represented in our brand, from our logo to our products ... The 'throttle'-like shape of a rocket converges to the logo. The button lighting up is meant to serve as an 'electric' flame." She adds, "the RocketSkates is meant to invoke the feeling of a futuristic, industrial vehicle." If that sounds like an enticing proposition, you'll have to pay a pretty penny for it. The regular retail prices for these skates are $499 for the R-6, $599 for the R-8 and $699 for the R-10. Still, it appears several people do find it appealing enough to shell out a few bucks. A few hours into the 45-day Kickstarter and Acton has already sold out of its "Rocket Deal" where you could get a pair of the R-6 skates for $199 each. If you hurry, you can still snag a pair for around $100 to $200 off the retail price, and developers can grab the $499 pack if they want a chance to dig around the SDK. If the skates do reach their goal of $50,000, you can expect the first units to ship starting this September.